Former President Clinton canceled a planned tour Saturday of tsunami-hit areas of the Maldives. One U.N. official said the former U.S. leader was exhausted, while another said the cancellation was due to the weather. Cherie Hart, the regional communications officer for the U.N. Development Program and the coordinator of Clinton's visit, said the former president, who underwent a heart bypass operation in September, was not sick. But Brenden Varma, a U.N. spokesman in New York, said Clinton canceled the trip because of weather: "He is not exhausted. He is doing fine and he is going to continue with his busy schedule of meetings." 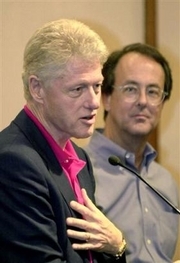 Erskine Bowles, Clinton's deputy, reiterated that the president was fine. "He has worn me out, though," Bowles told CNN. "There's no letup in this guy." Clinton, who was recently named special U.N. envoy for tsunami recovery, did not meet tsunami survivors in the tropical archipelago off India's southern tip as he had planned to do on Saturday, but he still expects to hold talks with business leaders and government officials Sunday at the resort. Those meetings, initially scheduled for Sunday morning, have been pushed back to the afternoon to let Clinton rest, said Maldives government spokesman Ahmed Shaheed. Clinton's spokesman Jim Kennedy said the remainder of the former president's trip was expected to continue as planned, and that Clinton would continue with four meetings and a press availability in the Maldives on Sunday, and then go to Banda Aceh, Indonesia, on Monday. U.N. Secretary-General Kofi Annan appointed Clinton in February to be the world body's point man for tsunami reconstruction, but a follow-up operation in March forced him to delay taking the job. Clinton said in April he could undertake any activities, and doctors told him his stamina should return. Clinton is in the midst of a four-day trip to India, Sri Lanka, the Maldives and Indonesia to ensure that aid is being distributed properly. The Dec. 26 earthquake and tsunami killed more than 176,000 people in 11 countries, and left about 50,000 missing and hundreds of thousands homeless. The former president appeared tired on arriving in the Maldives' capital, Male, from neighboring Sri Lanka late Saturday. He met for about 45 minutes with President Maumoon Abdul Gayoom before taking took a speed boat on choppy seas to the luxury resort of Kurumba, about 10 minutes away. In Sri Lanka, Clinton backed the president's proposal for the government and Tamil Tiger rebels to jointly distribute foreign aid to tsunami victims. Clinton will spend at least two years in his new role as the top U.N. envoy promoting recovery in tsunami-hit countries and demanding accountability for the unprecedented billions of dollars donated by countries and individuals, Bowles has said. While touring India in sweltering heat Friday, Clinton said aid groups have collected $3 billion in tsunami relief from the United States, Europe and other countries. Clinton said during an April 25 appearance at the United Nations that the world's response to the tsunami could serve as a blueprint for responding to future disasters. In February, Clinton and former President Bush visited four countries hit by the tsunami.